As we all know, calculating the phe & protein in your food is a pain. At first, it’s relatively easy: look up a food, weigh or measure it, and calculate the phe. But once you start cooking–for a child with PKU or for yourself — things get complicated fast. It is an awful lot of hard work and effort. And then on top of that you can start to drive yourself a bit crazy. Do you weigh it raw? Do you weight it cooked? Why the heck is the mg/g of phe in a baked potato, french fry and potato chip so vastly different – it is all just a single ingredient – a bloody potato! If I could go back in time, I think I would become a food scientist because this kind of stuff fascinates me. And so of course I volunteered to write an article on measuring phe in raw versus cooked foods! To run my tests, I had eight timers on, fifteen piles of 100 g carrots and fifteen piles of 100 g potatoes. There were post-its everywhere so I knew what timer was for what. There were warnings everywhere that if someone nibbled on my samples I would kill them. I felt a bit like the love child of the Swedish Chef and Beaker from the Muppets as I pretended to conduct a true scientific experiment, because the truth is there were loads of variables I did not control. But the end result was conclusive. DISCLAIMER: this experiment was designed to demonstrate the many ways that cooking foods can mess with the end mg/g. None of the values herein are authoritative mg/g because, as you’ll learn, there are too many variables to control for. Also, I’m just pretending to be a food scientist. Also, for many people, this level of specificity is unnecessary (on the Simplified Diet, carrots are often free!). But for others with low tolerances or an obsession with tiny details (guilty!) this information is fascinating. Measuring the phe in raw versus cooked foods confuses many people, and no wonder. Do you calculate your foods based on the cooked weight or the raw weight? Does it really affect overall numbers? The answer is a straight up: Always calculate phe based on raw, uncooked weight whenever possible. As you cook a vegetable, it can either take on weight while simmering in a liquid or lose its liquid/juice as it cooks. And the cooked weight is never consistent. The length of cooking time, cooking temperature, and the size of the food affect the end weight, which then impacts the mg/g of phenylalanine. 100 g of raw potato is 71 mg phe (.71 mg/g). 100g of potato, sliced thin and deep fried to make potato chips lost 61% of its weight. The phe remains at 71 mg but the new weight makes it 1.82 mg/g (71 mg/39 g). Sliced into sticks and deep fried, 100g of potato became 55 grams of french fries. Again, the phe remains 71 mg, but the new weight made it 1.29 mg/g (71 mg/55g). The fries could have been a little crispier so my guess is that if they had cooked for an extra minute they would have been closer to the 1.57 mg/g listed in HowMuchPhe.org (the analysis-verified value for McDonald’s fries). When brought to a boil and then tossed in olive oil and roasted in a 450 degree oven, 100 g of potato weighed 77 g after 15 minutes and 51 g after 30 minutes. In the end the mg/g went from .71 mg/g raw to 1.39 mg/g roasted. When boiled, the potato got heavier as it absorbed more liquid while it cooked. This is where I became a failed scientist because I lost some of the potato as it cooked – it kind of disintegrated in the water. Even with some disintegration that I do not know how to account for, at a rapid boil it went from 100 g to 104 g (.68 mg/g) and at a low simmer it went from 100 g to 106 g (.67 mg/g). 100 g of carrots raw are 22 mg of phe (.22 mg/g). When rapidly boiled (both bringing the water up to a boil with the carrot in it or dropping the carrot in rapidly boiling water), 100 g of carrots were 94 g after 10 minutes and 90 g after 20 minutes. The phe remains the same — 22 mg — but since the end weight changed so does the mg/g. It went from .22 mg/g raw to .24 mg/g (94 g/22 mg) boiled. The size of the cut (chunk, large dice and small dice) did not impact the end weight. When they completely cooled, the stupid carrot had lost another 2 g in steam. ARGHHHHH!!! When simmered, the carrot lost a little less weight. 100 g carrot simmered for 10 minutes weighed 98 g and simmered for 20 minutes weighed 95 g. Again, the phe remains 22 mg, but with the weight now at 95 g, the mg/g for simmered carrots was .23 mg/g. The size of the cut (chunk, large dice and small dice) did not impact the end weight. Both of these numbers are pretty different from the number listed in HMP for a cooked or canned carrot — .31 mg/g. Why? Why did the carrots lose weight and the potato gain it when boiled? I have NO IDEA because I only pretend to be a food scientist. Here is a fun fact: when HowMuchPhe.org did Amino Acid Analysis on canned corn (how awesome is it that they do this), the labs provided some interesting insight: the vegetables put in cans (in contrast to flash frozen) are often older (harvested later in the season) and their starch content is different, which in turn affects their protein content. Those tests found that canned corn had 85mg phe per 100g, where the USDA value for cooked corn is 155mg per 100g. So interesting AND so confusing (which is why I want to be a real food scientist). 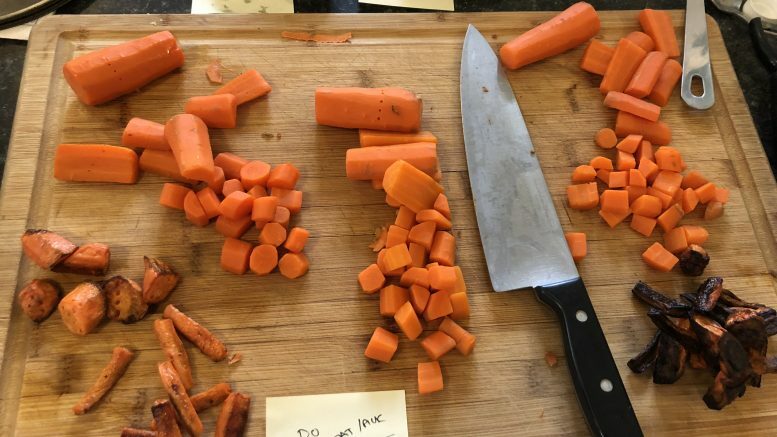 When 100 g of carrots were roasted at a lower temperature (350 degrees), their weight was dramatically different and the smaller the cut, the more weight lost. 100 g of large diced carrots was 70 g after 15 minutes and 50 g after 30 minutes. This means the roasted carrots went from .22 mg/g to .44 mg/g. The smaller diced carrots went from 100 g to 56 g after 15 minutes and 36 g after 30 minutes. That means the phe went from .22 mg/g to .61 mg/g! The smaller the cut, the more weight lost. WHAT THE WHAT!!!! At 450 degrees the carrots were even lighter (and totally burnt). The conclusion is this: cooking a vegetable impacts the end weight, and many factors are at play: the temperature it is cooked at, the method of cooking, the size of the vegetable and the amount of time it cooks. Therefore, your best bet is to calculate the phe in a recipe by adding up the phe in the raw ingredients and then dividing that number by the end cooked weight. HowMuchPhe.org‘s recipe feature makes this so easy!